TravStar1 Point Of Sale SystemManager's Work Station Daily ProceduresHow Do I Run the Price Change Report? How Do I Run the Price Change Report? This lesson will teach you how to run the Price Change Report. From the Daily Procedures tab, click on the "Price Change Report" button. The Price Change Report screen is used to show price changes made. (1) Click beside any of the General Options. You always want to select Report Price Changes and Print Detail. (2) Select a printer. It is recommended to view the report online before printing. (3) Click on the "RUN"button. Type in the register name then click on the "OK" button. This is an example of the Price Change Report. 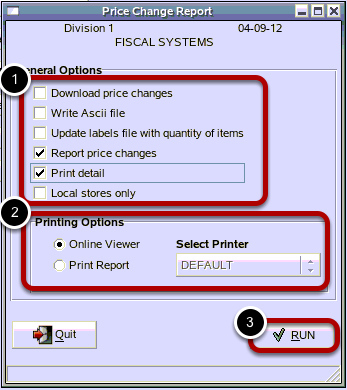 Once you are finished viewing the report, click on the "Print" button to print the report then click on the "Quit" button. Click on the "Yes" button to clear the price changes. If the "Yes" button is not selected then the price changes will continue to accumlate for that register. Repeat the Price Change Report for each register. Prev: How Do I Run an End of Day on the Manager's Work Station? Next: How Do I Backup the Manager's Work Station?